Support, or read more about Grid-Hammer on Kickstarter! It seems at one time or another every major science fiction franchise features at least one scene with people or aliens huddled around a futuristic-looking board game. Star Trek featured Tri-Dimensional Chess and Star Wars featured Dejarik (or sometimes called Vrax) played on a holographic table with three-dimensional creatures. Well, there’s a new sci-fi game in town called, Grid-Hammer, and I can’t help but thinking I am playing a game intended for a cameo in a future J.J. Abrams film. I can just see this game’s slick-looking pieces gleaming with lens flare as the camera swoops across the tabletop to reveal a dramatically-lit grid. I knew I was in for a treat when my prototype set arrived in the mail from Night Lemon Publishing. The amount of time invested in constructing paper versions of the pieces was frankly astounding. The board will be engraved so as to allow each piece to “catch” perfectly in each square when they are moved or rotated. I personally find the printing, folding, tucking, and cutting involved in any paper-construction project to be my personal ticket to a week-long stay at an asylum. I’m not saying the designers are crazy or anything, only that their dedication in preparing this game for reviewers – in and of itself – is noteworthy. I should also note that the final Grid-Hammer product — the board and pieces — will be manufactured with high-quality, heavy ABS plastic, The board will be engraved so as to allow each piece to “catch” perfectly in each square when they are moved or rotated. The premise of Grid-Hammer is simple – maneuver at least one of your ten pieces across a 9×9 game board (hereafter referred to as “the Grid”) and exit the opposite side before your opponent does the same. On your way across the Grid you’ll find yourself blocking, capturing and intimidating your opponent in order to make your job a little easier. No matter what strategy you end up using, I found there’s no way around sacrificing your pieces for the greater good, and you’ll often be doing so for the sake of opening lanes, diverting attention or creating opportunities to capture an opponent’s piece, which you accomplish by landing on it. At your disposal in this endeavor are 5 scouts, 4 guards and a base that form a double line of five pieces at the start of the game. You alternate turns with your opponent, using up to 3 points of movement. The construction of the pieces themselves makes movement easy to remember. 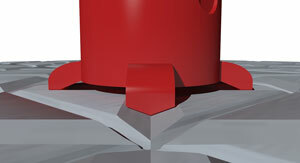 Each piece has a number of depressions on its surface equal to its movement allowance. I love it when game designers think beyond the mechanics of a game and find a way to incorporate them into the aesthetics of the pieces themselves. The scouts have three indentations on their playing piece, and therefore may move up to three spaces; the guards may move up to two spaces; and the base, one space. 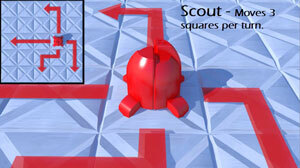 Besides their slower movement, the guards and the bases are differentiated from the scouts by their shields. These two pieces, which are larger than their scouting counterparts, are shielded on one of their four sides. The shield acts as a barrier against capture so that you can never capture a piece when attacking it from its shielded side. During gameplay, the guards and bases may use movement points to rotate 90 degrees and change their facing. When encountering an enemy line comprised of two or more shielded guards, pray that the strategic side of your brain kicks in. Finally, the single base on each side has an additional perk (besides the shield). They may actually carry and transport another piece from your side or allow a friendly piece to march over it. Moving a guard to the top of your base makes for an interesting coupling, as the pairing can afford shielding on two sides, provided you spend a movement point to rotate one of them. 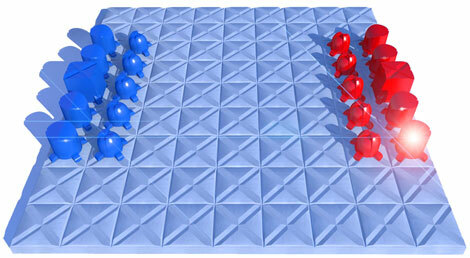 It’s difficult to play Grid-Hammer without drawing at least some comparisons to chess, but there is also an element of American football as you work to protect your star player as he rushes across the Grid, weaving in and out of opposing players while devising ways to neutralize the opposition. This is the “Chrome Expansion” and a limited edition item available only through the Kickstarter campaign. 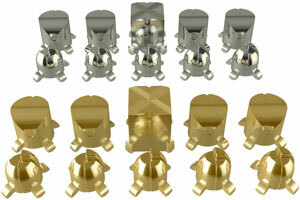 But the pieces will not really be chromed. They will be metallic-colored ABS plastic with a gloss finish much like a plastic toy sword. Grid-Hammer is about balancing your desire to press forward while maintaining a solid defense. In my games I often found myself conflicted. Do I set up a situation where my opponent is compelled to react, drawing his attention away from another area of the board, or do I work to neutralize threats directly? What I like is you can choose to do a combination of both, because the movement rules allow you to switch between pieces on your turn, never having to expend a piece’s full movement allowance. As such, you can march a line of three scouts ahead one space or move one of them a full third of the way across the Grid. My opponents and I found ourselves engrossed in a game with great strategic depth and decision-making, which is a stellar accomplishment for a game that can be taught in 5 minutes or less. If you want to kick up the difficulty level, you can play Grid-Hammer with four players and double the number of pieces on the board, or you can add elevation tiles to ratchet up the strategic maneuvering. There are even additional expansions in the works that will give your pieces unique abilities beyond those referenced above (think rotating “attachments”). If you’re not offended by the inevitable lens flare and enjoy a clean, quick-playing, yet highly strategic board game, I recommend that you acquire a copy of Grid-Hammer on Kickstarter when it launches. I know at least a few people who are already planning on it.